The GOP War On Knowledge…or how the skids are being greased for America’s decline and fall. I’ve got a backlog of stupid and dangerous ideas and claims out there I want to blog about — one of the nice things about being a self-selected watchdog for duplicity and useful ignorance on the web means I’ll never lack for targets — but I want to highlight a theme that links a lot of what I’m raging about these days. That would be the escalation in the Republican and right wing’s Thirty Years War on the idea of knowledge and the significance of expertise in public life. You can see it everywhere these days, and I’ll be blogging over the next several days about the latest forays in this from all the usual suspects in this, from the incomparable (and I don’t mean in a good way) George Will, to that genial tribute to mediocrity in high places, David Brooks. Those tw0 — and many others — share this particular incoherence: they stake their claim to authority through an assertion of a peculiar kind of expertise, in particular, the ability to interpret technical knowledge and to divine social patterns, while at the same time decrying the authority of the more specialized skills that produce facts and interpretations with which they disagree. More simply: no one knows anything except me. The animating motive behind such bathos is not simply self-aggrandizement (though that is surely a feature and not a bug). Rather it is aimed at discrediting genuine expertise, actual specialized knowledge and/or craft skills. Both men (and many others) are actively and overtly trying to reclaim power for an aristocracy of birth, institutions, or certain interests, and hence find claims of authority independent of unearned descent or association a deep threat. Simply: as long as, say, Paul Krugman, exists to tell them they don’t know what they are talking about, then those who would rather accelerate the transfer of wealth from the middle to the top, have to find ways to deny his credibility, his authority-born-of-knowledge to label their stupid claims for the folly they are. More broadly, the game now is to paint one side — the side that did not author our current disaster — as a hopelessly out of touch and inherently incapable group of impractical experts, folks who know only theory and have none of the so-called common sense needed to recognize that the succour of the rich and powerful is the alpha and omega of sound policy. It’s Spiro Agnew updated for the digital age, with the pointed headed intellectuals now turned into mindless social engineers recrafting America to match some abstract (probably French) social theory. A type specimen of this kind of “thought” (sic!) comes from one of the perennial suspects, Michael Barone, of Town Hall. You know you are in for a familiar ride when you get an invocation of both the patron (if more admired than read) saint of self-styled American conservatives, Edmund Burke…and a peculiar (given Burke’s essentially elitest bent) appeal to mass opinion. …. they take the very un-Burkean view that those with elite educations can readily rearrange society to comport with their pet abstract theories. These often secular Americans have a quasi-religious faith in government’s ability to, in Barack Obama’s words to Joe the Plumber, “spread the wealth around” and to recalibrate the energy sector to protect against climate dangers they are absolutely sure are impending. That is: a party that seeks to return the regulation of the financial markets to the American norm of about 1988, say…and to introduce into oligopolic structure of the American health insurance market just a smidgeon of quality control and the possibility (not the certainty) of price competition in certain areas, not to mention access for those increasingly pushed out of a shrinking employer-provided health care system…and to construct a market structure for pricing known externalities of energy use has gone all Rousseau and Robespierre on us, instead of presenting what is barely distinguishable from a plausible Republican party platform from the 1950s through at least the candidacy of Gerald Ford. Of course it’s nonsense, and I’d even wager that Barone in some lizard brain moment of intellection might realize that while what he spouts are words, they lack any meaningful connection to the reality he purports to document. But that’s the point. It’s not that what my party wants to do is so dangerous, in fact. It’s that the existence of an alternative claim on reality — or rather, reality itself — is unacceptable…so instead of engaging in an argument one might lose, the real mission is to make sure that the whole idea an argument is possible (much less a loss) gets destroyed. So, despite the fact that the right is exercising a near monopoly on abstract theories (tax cuts raise revenues, e.g.) that engineer institutions (think, for example an explicitly anti-market Medicare drug benefit, and/or a non-regulating financial regulatory apparatus) to produce through massive transfers of both wealth and power from the middle and poor to the rich…it’s imperative to ensure that folks who actually know stuff in detail about the critical decisions we are in fact making don’t actually get a place at the table. Because we know what happens when they do. Folks like the ones Barone wants to see in power get their heads handed to them. This is what is going to make today’s farrago so fascinating, by the way. Here’s hoping for a massacree. PS: As an extra special bonus, how about a little reality check on what today’s faux Burkeans are actually asking us to accept, in the words of the great man himself. This is no reflexive “that which governs least, governs best,” conservatism of the kind invoked (as they undermine it, usually) by its very priests and preachers. Rather it is what it seems: a deference to authority. That’s the key: it’s not that self-styled Burkeans want to deny a privileged decision making status — the right to engineer society — to everyone. They just want to make sure, as the powerful and their sycophants always have, that only the right people have access to the tools needed. Burke defended prejudice on the grounds that it is “the general bank and capital of nations, and of ages” and superior to individual reason, which is small in comparison. “Prejudice”, Burke claimed, “is of ready application in the emergency; it previously engages the mind in a steady course of wisdom and virtue, and does not leave the man hesitating in the moment of decision, skeptical, puzzled, and unresolved. Prejudice renders a man’s virtue his habit”. Prejudice: that which is known without questioning the means of its knowing, and which serves to reinforce truths that thus need not be tested against reality at the moment of decision. This is the kind of approach that asserts, despite all evidence and experience to the contrary that, say, the correct response to the near destruction of our financial system in 2008 is increased power and decreased regulation of the actors who brought about the disaster in the first place. Because it is known, rather than investigated, that markets never fail, then the failure of a market can only be due to its deviation from the Platonic ideal of Marketness. And as we know this, we have incorporated it into our body of prejudice, now, at the moment we must choose, we know what to do: Free the Banksters! Or perhaps a more homely*** example will do: it is Burkean, if one wanted to push the words quoted above not that far beyond the limit of their plain meaning, to extend the prejudice that rendered African men three/fifths of human being at the political settlement of the revolution that Burke endorsed to an unconsidered belief that it remains illegitimate for an African-American man today to claim supreme executive authority today. Hence, while it remains on the fringes (but sadly, not beyond them) of respectability to assert that President Obama is a foreign born agent of foreign powers, or simply a lesser human (think the witch doctor images and so on), how could any Burkean condemn such sentiments as anything more than an expression of what that foundational prophet of conservatism would have applauded as benign–nay beneficient — prejudice. And yes, I know that I am quote-picking here. And I’m not suggesting a Burke thinking and writing in the 21st century would have found Obama’s rise to power illegitimate. (Though I do think the 18th century Burke would have been unable to imagine an Obama’s presidency — remember: the past is a different country). What I am saying that dressing oneself now in the cloak of Burkean virtue is a tricky business — and that’s putting it nicely. *This post isn’t about that, but while it’s fair to say that anti-incumbent sentiment and some populist resentment played a significant role in Brown’s victory — it’s worth noting that Brown was exceedingly fortunate in his opponent. I’ve volunteered on Democratic campaigns in MA since 1976, and nothing has approached Coakley’s for shambolic ineptitude…and I speak as one who made calls for some pretty clueless folks in my day. Counterfactuals are odious, but I find it hard to believe that if Mike Capuano had been the Democratic candidate the Brown campaign would ever have been given their open playing field. That said — Brown certainly ran a very good campaign, which he would have done against anyone. But if you actually pay attention to what happened on the ground here in MA, it is absurd to read in the results of this special election a grand philosophical revelation, and those who do are either or both deluding themselves and trying to argue for something that they cannot otherwise defend. **To be fair, one can just as well term the conflict a civil war — though that overstates the degree to which the Stuart side mounted anything like an active defense — or, perhaps better, as a coup with Parliamentary interests aligned with those of major magnates and against an erratic and totalizing monarchy. It was revolutionary only in the most limited sense. It did alter the succession of the monarchy, and it certainly shifted the balance of power between Parliament and the hereditary executive. But for all that William III was in some sense the first English monarch to be hired as a kind of proto civil servant, the decapitation of the Stuart monarchy and the expansion of Parliamentary control of governance was as evolutionary as it was transformative. **In every sense of the word. 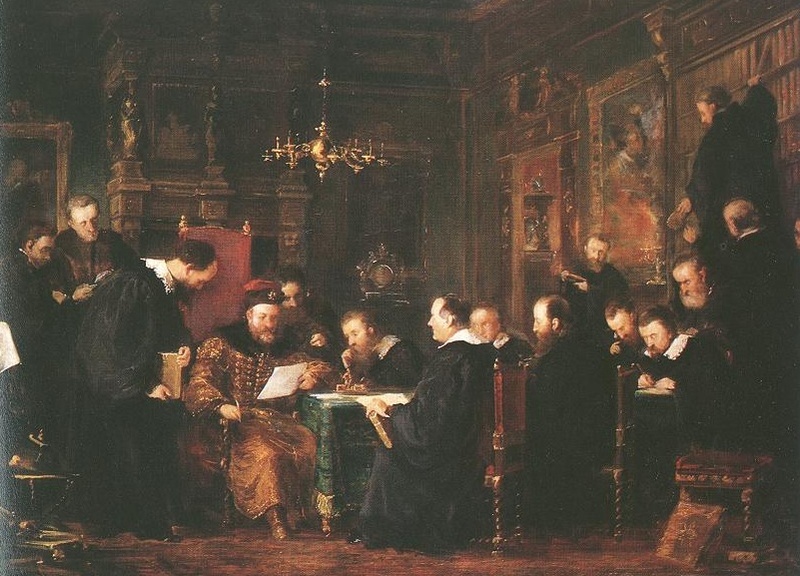 Image: Dósa Géza “Gábor Bethlen among his Scholars” 1870. Tags: Bad Punditry, Fear of Reality, Republican knavery, Why does knowing stuff make you wrong?